Pine-hyacinth is an endemic perennial wildflower found in moist flatwoods, sandhills and prairies throughout much of the Florida peninsula. It typically blooms in spring through fall. Its flowers attract a variety of pollinators, while its fruit provides food for many birds and small wildlife. Pine-hyacinth’s distinct nodding flowers are pinkish-white to lavender. 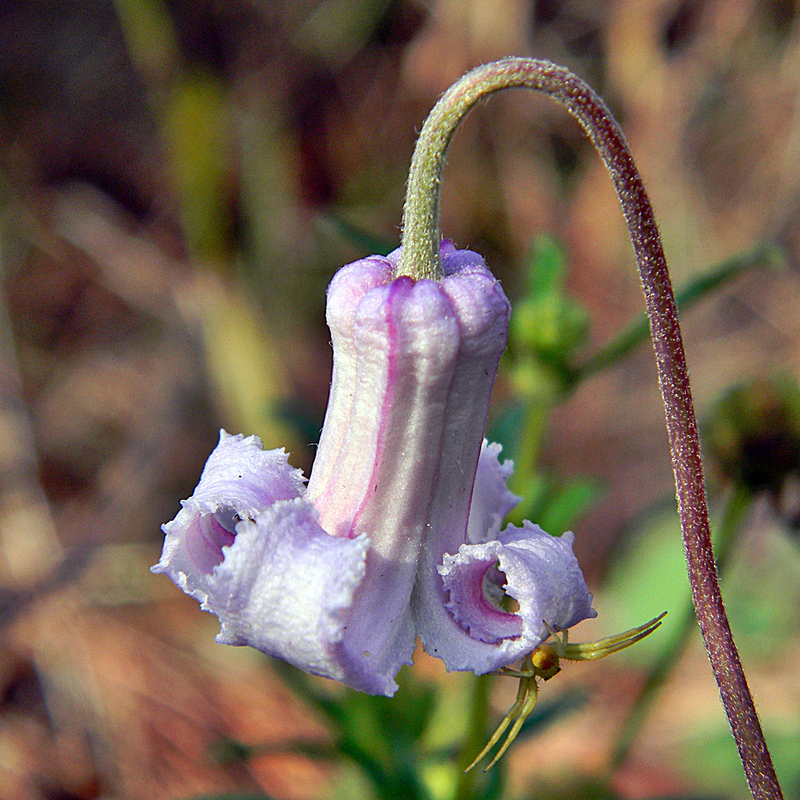 No petals are present, but the four petal-like sepals are fused at the base, giving the bloom a bell- or urn-like shape. The sepals separate and become revolute as the flower opens. Sepal margins are thin and undulate. Flowers are solitary and borne on slender, unbranched stems. Leaves vary from oval– to lanceolate-shaped or may be pinnately divided. They are oppositely arranged. Fruits are achenes with long silky tails. The genus name Clematis is from the Greek clématis, or “climbing plant.” The species epithet baldwinii pays homage to American botanist William Baldwin (1779–1819). Pine-hyacinths are not related to true hyacinths. To see where natural populations of Pine-hyacinth have been vouchered, visit www.florida.plantatlas.usf.edu. Garden tips: Pine-hyacinth is slow-growing and may live for many years. Seeds can take a long time to germinate, but plants may produce flowers within six months. Once established, it is fairly drought-tolerant. Pine-hyacinth plants are often available at nurseries that specialize in native plants. Visit PlantRealFlorida.org to find a native nursery on your area.